Four round pro-am tournament -$60,000 professional prize money - Great amateur prizes. World class beachfront accommodation at an amazing new golf resort. Four round pro-am tournament -$60,000 professional prize money- Great amateur prizes. 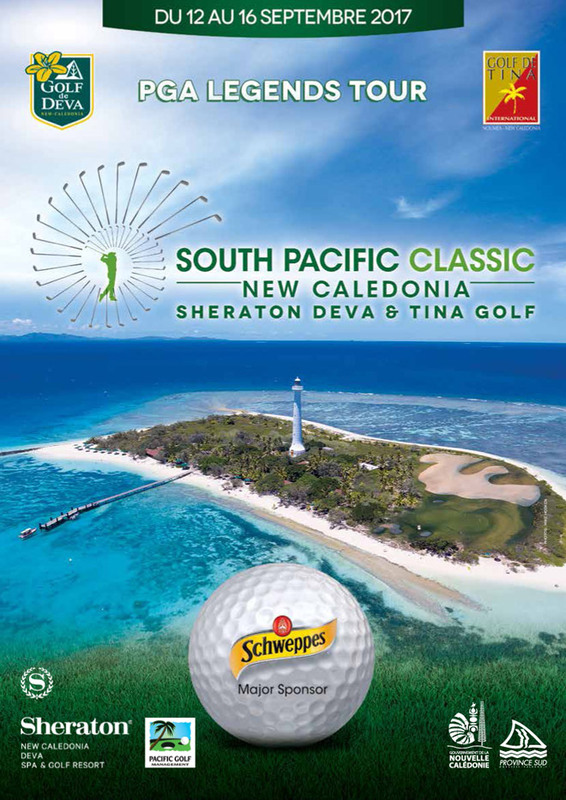 The inaugural Sheraton Deva Legends South Pacific Open will take place on September 11th to 16th, in New Caledonia. The field will be made up of approximately 40 professionals and 80 amateurs. We have only 40 spots available for overseas amateur golfers to compete in this event. The tournament is open to men or women. All amateurs must have a current handicap, the handicap limits are 27 for men and 30 for women. As part of the Australasian PGA Legends tour, this a great opportunity for amateurs to play with some of the household names of professional golf at an exotic location in a relaxed atmosphere. The Australasian Legends Tour has over 60 tournaments in 2017 which are played in Australia, New Zealand, Samoa, Fiji and New Caledonia. It’s not hard to see why the tour is so popular when you have former British Open, USPGA, Australian & NZ Open’s and PGA Championship winners playing in the events. Players such as Ian Baker Finch, Peter Senior, Simon Owen, Rodger Davis, Mike Harwood, Peter Fowler and Wayne Grady, all have been world class professionals winning numerous major championships around the globe over the past 40 years. They are just some of the top names that regularly play on the Legend Tour. The first two rounds of the tournament will be played at the fantastic new Sheraton Deva championship course in Bourail, then a day off to travel back to Noumea, followed by the final two rounds at the Tina golf course. All competitors will play the four rounds of the tournament. There will be one professional and 3 amateurs in each group for the first 3 rounds, then the final round will be a seeded draw on score with the two leading pros paired with the leading two amateurs and so forth through the field. Accommodation for the first three nights will be at the newly opened $250 million Sheraton Deva Resort & Spa which is located at Bourail, a leisurely 2 hours drive to the north of Noumea Airport. 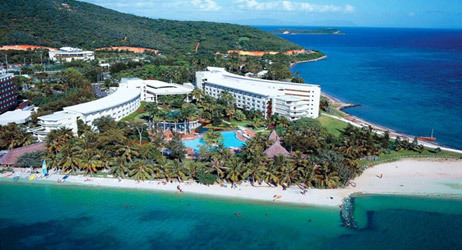 This exceptional beachfront resort has 180 rooms, suites & bungalows, 15 kilometres of white sand beach, amazing food and plenty of activities for the non-golfers. On day four, you’ll be transferred to New Caledonia’s capital, Noumea, where you will spend 3 nights at the beautiful waterfront of the Meridien Hotel. The Grand Casino is next door and the hotel is only 10 minutes away from downtown shopping area and the Tina golf course. The Sheraton Deva championship golf course is part of the fantastic Sheraton resort & Spa. The excellent new Dye Design golf course is one of the best in the South Pacific, with great layout, beautiful condition and very playable for all golfers. The Tina course is located close to downtown Noumea (the “South of France” in the Pacific). The course has a very picturesque undulating design and a good challenge that everyone will enjoy. This course has been hosting an Australasian PGA tour event for the past 9 years. New Caledonia is only a short flight from Auckland, Brisbane, Sydney , Melbourne and Nadi. There are various airlines operating flights to Nomuea. Aircalin is the preferred airline for this event and are offering a special discounted fare to all competitors and partners taking part in the tournament. To access the special fare please phone Aircalin in Australia phone 1300 655 737 , New Zealand 0508247225, and quote Legends South Pacific Open for the discount to be applied. Arrival at Noumea and transfer to Sheraton Deva Resort & Spa, where accommodation has been booked for the next 3 nights, welcome cocktail function. Optional practice round at Deva. Round one South Pacific Open at Sheraton Deva golf course, one pro and 3 amateurs in each group, evening drinks function. Round two South Pacific Open at Sheraton Deva golf course, one pro and 3 amateurs in each group, evening drinks function. Depart the Sheraton and transfer by coach for the 2 ½ hour trip to Noumea, check in to the Meridien Hotel, optional practice round at the Tina golf course. Evening function at the Grand Casino which is located in the grounds of the Meridien Hotel. Final round of the South Pacific Open at Tina golf course, seeded draw with leading players teeing off together, Prize presentation diner at the Meridien Hotel. Leave the hotel to Noumea airport for your homeward journey.